The Duke spoke to staff on the Brompton Cycles production line while touring the folding bicycle firm’s headquarters at Greenford in west London. Phillip, who showed a keen interest in the powder coating ovens process as he was introduced to workers at all stages from the drawing board to delivery, then unveiled a plaque to mark the opening. Brompton Bicycle moved to a bigger factory in West London in a drive to double output of the folding commuter bikes which carry its name. The company moved to the new facility in Greenford, West London, which is twice the size of its current factory in Brentford. The factory will allow Brompton to double it’s production to around 100,000 folding bikes per year. The Brompton company is a rare example of a UK bicycle manufacturer that has succeeded in competing with brands produced in Asia. It currently accounts for around 80pc of all British bicycle exports. The Powder Coating system TD Finishing installed at the new factory gives the company the facility to automatically pretreat and powder coat all the components required to build the unique folding bike. The facility consists of a 5 stage online spray pretreatment plant utilizing the high performance Chemetal Oxsilan process. The process allows Brompton to have high corrosion standards, whilst still being within the strict Thames Water discharge limits, without the normal effluent treatment requirements of standard high performance chemicals. The 5 stage pretreatment plant is constructed from stainless steel and incorporates design feature such as high efficiency small bore burner, quick change spray nozzles assemblies, stainless steel pumps and a reverse osmosis water treatment unit. After pretreatment, the products enter the two pass gas fired drying oven for 7 minutes at an air temperature of 150⁰c. The oven takes advantage of TD’s high efficiency air distribution design, with the added advantage of fully modulating high efficiency gas burners. On exiting the drying oven products remain with a pressurized ventilated enclosure to ensure contamination of the components is kept to a minimum. Housed within the ventilated enclosure is the Gema automatic colour change booth, complete with colour feed centre and powder recovery system. The booth has manual touch in stations at both the entry and exit positions to assist in full coverage of the most difficult components of the folding bikes. demanding performance required from such a high quality product. When powder curing is complete the products exit the oven, cool off before being manually off loaded and inspected. 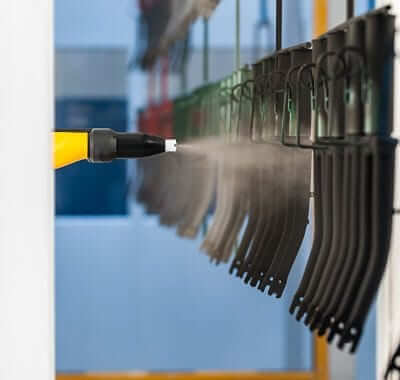 You might like to read about our blog on spray pretreatment.